Men treated with hemodialysis (HD) have a very poor prognosis and an elevated risk of premature cardiovascular disease (CVD). In the general population, associations between low testosterone concentrations and cardiovascular risk have been suggested. 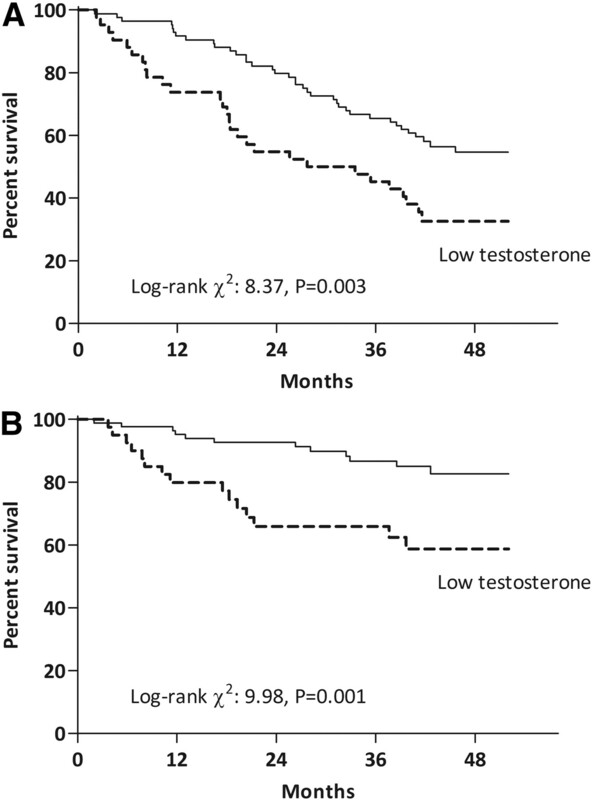 We performed a prospective observational study involving a well characterized cohort of 126 men treated with HD to examine the relationship between testosterone concentration and subsequent mortality during a mean follow-up period of 41 mo. Independent of age, serum creatinine, and sexual hormone binding globulin (SHBG), testosterone levels inversely and strongly associated with the inflammatory markers IL-6 and CRP. Patients with a clinical history of CVD had significantly lower testosterone levels. During follow up, 65 deaths occurred, 58% of which were a result of CVD. Men with testosterone values in the lowest tertile had increased all-cause and CVD mortality (crude hazard ratios [HRs] 2.03 [95% CI 1.24 to 3.31] and 3.19 [1.49 to 6.83], respectively), which persisted after adjustment for age, SHBG, previous CVD, diabetes, ACEi/ARB treatment, albumin, and inflammatory markers, but was lost after adjustment for creatinine. In summary, among men treated with HD, testosterone concentrations inversely correlate with all-cause and CVD-related mortality, as well as with markers of inflammation. Hypogonadism may be an additional treatable risk factor for patients with chronic kidney disease. Despite the increased prevalence of hypogonadism and its potential consequences, limited data are available on the influence of endogenous testosterone and replacement therapy in CKD patients.16 However, testosterone abnormalities have recently been linked to disorders in bone composition,17 to sRANKL levels,17 and to endothelial dysfunction18 in CKD patients. In light of the association between low testosterone concentrations and the risk of developing future cardiovascular events recently reported in nonrenal patient groups,5,19 we evaluated the possible contribution of testosterone levels to the poor prognosis and the elevated CVD risk of male hemodialysis (HD) patients. The male population presented a median age of 63 (interquartile range 49 to 73, range 29 to 86) years. Thirty-five (27%) of the men presented diabetes mellitus, whereas 85 (66%) had a clinical history of CVD. Patients were treated with HD three times a week (4 to 5 h per session) using bicarbonate dialysate and high-flux (23%) or low-flux (83%) dialysis membranes. Most patients were on antihypertensive medications [β-blockers, n = 69, calcium-channel blockers, n = 33; and angiotensin converting enzyme inhibitors (ACEIs)/angiotensin receptor blockers (ARBs), n = 46], as well as other commonly used drugs in terminal CKD (such as phosphate and potassium binders) and vitamin B, C, and D supplementation. Forty-three patients were on lipid-lowering medication (statins). One hundred and twenty four patients were receiving erythropoiesis stimulating agents (ESAs) at time of evaluation. The median ESA equivalent dose was 10,000 (6000 to 14,750) U/wk, which was normalized for body weight and presented as U/kg/wk in the following analyses. The levels of total testosterone presented a median value of 9.95 (7.2 to 12.0) nmol/L [equivalent to 286 (206 to –346) ng/dl]. Sixty-six men (52%) had testosterone deficiency (<10 nmol/L, or <288 ng/dl), 39 (32%) presented testosterone levels in the lower normal range (10 to 14 nmol/L, or 288 to 403 ng/dl), and only 21 (16%) presented normal testosterone values. No differences in testosterone levels were found between consumers and nonconsumers of nonsteroidal anti-inflammatory drugs, β-blockers, calcium channel blockers or statins (data not shown). Only the use of ACEIs/ARBs had an effect on the levels of testosterone, and slightly higher levels were observed [11.5 (8.8 to 13.2) versus 9.7 (6.5 to 12.0) nmol/L, n = 46/80, P < 0.01] in treated patients, probably a reflection of a borderline significance in age [62 (47 to 70) versus 66 (51 to 76) yr, P = 0.06]. The general characteristics of the patients according to low testosterone values are presented in Table 1. Patients with low testosterone were defined as those below the 33rd percentile (lower tertile) of distribution in our sample population, which was set at the level of <8.1 nmol/L (or <233 ng/dl). The 66th percentile was set at 12.0 nmol/L (or 345 ng/dl). Despite not presenting differences in age, the patients with low testosterone showed an increased number of comorbidities, mainly accounted for by the presence at baseline of a clinical history of CVD events. Patients with low testosterone more often presented signs of protein-energy wasting (PEW) and lower handgrip strength values. The markers of inflammation [high-sensitivity C-reactive protein (CRP), IL-6, fibrinogen, and plasma long pentraxin-3] were elevated in this patient group, and the proportion of hypochromic red blood cells (RBCs) and the erythropoietin (EPO) requirements were higher. Finally, the levels of sexual hormone binding globulin (SHBG), free testosterone, and bioavailable testosterone were also decreased in the patients with low total testosterone. As expected, testosterone levels decrease with increasing age (Table 2), and move in the same direction as SHBG, free, and bioavailable testosterone. Confirming the observations of Table 1, testosterone levels were positively correlated to s-albumin, s-creatinine, and LDL-cholesterol levels, and a strong negative correlation was observed for the proportion of hypochromic RBCs. Of interest, the levels of testosterone were strongly and negatively related to a variety of surrogate markers of inflammation, especially with IL-6 and CRP. Similar observations were made for the free and bioavailable estimates (data not shown). To test whether the relationships between IL-6, CRP, and testosterone were a reflection of natural aging, we performed a multinomial logistic regression analysis for these associations correcting for s-creatinine, age, and levels of SHBG (Table 3). Analyses showed that the associations between testosterone and inflammatory markers were independent of age, s-creatinine, and SHBG concentration. Regression models were repeated for free and bioavailable testosterone, with results being the same (data not shown). The levels of testosterone were lower among patients with a clinical history of CVD as compared with those with no history of CVD [9.4 (6.5 to 12.0) versus 12.0 (9.5 to 14.2) nmol/L; P = 0.003]. The same was true for free [0.21 (0.15 to 0.29) versus 0.25 (0.19 to 0.32) nmol/L; P = 0.03] and bioavailable [4.0 (2.8 to 5.5) versus 4.9 (3.5 to 7.0) nmol/L; P = 0.01] testosterone. Because patients with CVD were older [66 (55 to 75) versus 57 (43 to 71) yr, n = 84/42; P = 0.005], we performed a multinomial logistic regression to test whether this association was solely a reflection of the process of aging (Table 4). Again, analyses showed that the associations between testosterone and clinical CVD were independent of age and SHBG levels. Across decreasing testosterone tertiles, the odd ratios for CVD were incrementally higher. During the follow-up period, 65 (51%) patients died, 38 (58%) from CVD-related causes. The baseline testosterone levels in the patients who died from CVD [8.0 (6.1 to 11.0) nmol/L] was lower (P < 0.05) than the testosterone levels of patients who died from non-CVD-related causes [11.0 (8.3 to 12.0) nmol/L]. Consequently, Kaplan-Meier analysis (Figure 1) showed that patients with low testosterone (below the 33rd percentile) have an increased mortality by all causes [log-rank χ2 8.37, P = 0.003; hazard ratio (HR) 2.03, 95% confidence interval (CI) 1.24 to 3.31, P = 0.004] and CVD-related causes (Log-rank χ2 9.98, P = 0.001; HR 3.19, CI 1.49 to 6.83, P = 0.008). By using the Cox proportional hazards model, we corrected these differences for potential confounding factors (Table 5). The prognostic value of low testosterone levels on mortality by all causes and CVD-related causes persisted even after adjustment for age, SHBG, baseline comorbidities (CVD and diabetes mellitus), ACEI/ARB medication, s-albumin, and inflammation (depicted as IL-6 levels). In search of potential mechanisms behind this observation, further adjustment for s-creatinine resulted in the loss of significance and a considerable loss in the magnitude of these effects. Kaplan-Meier survival analysis for (A) all-cause and (B) CVD-related mortality in 126 prevalent men undergoing HD according to testosterone levels. Low testosterone levels were defined in our sample population as those below the 33rd percentile of testosterone distribution (see results). The study presented here reveals a link between low endogenous testosterone concentrations and increased mortality due to all causes and to CVD in men undergoing HD. Although this relationship was independent of age, SHBG, baseline comorbidities (CVD and diabetes), and inflammation, it may be related to muscle depletion (represented by s-creatinine levels). Also, the presence of clinical signs of CVD at the time of inclusion was associated with lower testosterone levels irrespective of age and SHBG. Finally, a strong and inverse association between testosterone and various inflammatory markers was observed. In agreement with previous reports in CKD patients,12,13,16 more than 50% of our patients presented testosterone levels below the normal range, and a further 30% presented testosterone levels in the lower range of normality. This distribution reflects the high prevalence of hypogonadism in CKD. The mechanisms explaining the high prevalence of hypogonadism in CKD are not completely understood. Dysfunction of the hypothalamic-pituitary-testicular axis exists, and decreased synthesis and secretion of testosterone follows with progressive renal failure. Although some testosterone may be removed by HD, increased clearance cannot explain the low testosterone levels.20,21 In addition, stress, medication, and weight loss may also contribute. Testosterone circulates in plasma freely, bound to specific plasma proteins (e.g., SHBG), or weakly bound to nonspecific proteins such as s-albumin. The SHBG-bound fraction is considered to be biologically inactive because of the high-affinity binding to SHBG. Therefore, one strength of the study presented here is represented by the adjustment for SHBG in all of our multivariate analyses, indirectly indicating a reduced biologic activity of testosterone in our patients. Moreover, we can also demonstrate that because both the SHBG and the testosterone levels are decreased, the free and bioavailable fractions remain decreased in a similar manner. Previous studies in male nonrenal patients have shown that low endogenous testosterone concentrations are associated with a more harmful CVD risk factor profile and a higher prevalence of metabolic syndrome components.22,23 In addition to sexual dysfunction, testosterone deficiency is also associated with the loss of muscle mass.16,24 In our study, patients with low testosterone levels had lower handgrip strength and lower s-creatinine levels. In stable HD patients, s-creatinine levels are a crude reflection of muscle mass and fairly correlate with handgrip strength and lean body mass.25 Because testosterone actively induces muscle protein synthesis,26 and androgens such as nandrolone decanoate (alone or in combination with resistance exercise training) has proved to have anabolic effects in CKD patients,27 these results were not unexpected. Furthermore, our observation that men with low testosterone have increased ESA requirements may be due to loss of the stimulatory effect of testosterone on erythropoiesis.28 In fact, testosterone treatment has a positive effect on anemia in HD patients and may enhance erythropoiesis even in other types of anemia in which ESA treatment is relatively ineffective.29 This observation is of interest and warrants further study, because testosterone assessment and supplementation in deficiency states may help to initiate preventive anemia strategies in the CKD population. An additional novel finding in our study is the strong negative association between testosterone levels and various inflammatory biomarkers irrespective of age, s-creatinine, and SHBG levels. There are a very few studies in the literature indicating a relation between testosterone levels and inflammatory markers. Although the normalization of testosterone in type 2 diabetic patients leads to concomitant reductions of inflammatory cytokines30 results of experimental studies have been contradictory: Although after renal injury in rats31 both the endogenous and the exogenous testosterone seem to be pro-inflammatory by stimulating TNF-α production, they have been reported to favorably contribute to regulation of atherosclerotic plaque growth and stability by lowering inflammatory molecules in castrated rabbits.32 Because our cross-sectional study cannot provide the direction of this association, intervention studies addressing this issue are needed to provide evidence for a causal direction. The main finding of the study presented here is the prognostic value of low testosterone levels for mortality by all causes, but especially by CVD. We report that testosterone was a marker of pre-existing CVD and also an independent risk factor for CVD death. Thus, our study is in agreement with the majority,2,3,5,19 but not all33 of the previous studies in nonrenal patients supporting the hypothesis that testosterone deficiency is implicated in the progression of CVD. In agreement with a previous study,2 adjustment for IL-6 levels resulted in an attenuation of the prognostic value of low testosterone on mortality. Whether persistent low-grade inflammation (as commonly observed in CKD) contributes to decreasing testosterone levels or vice versa is currently unknown, and it cannot be ruled out that it represents a vicious circle in which gonadal dysfunction causes or facilitates increased inflammatory activity, which in turn further suppresses testosterone production. Nevertheless, there is supportive evidence suggesting mechanisms through which testosterone, per se, influences mortality and specifically cardiovascular end –points. First, testosterone levels have been inversely related to the progression of atherosclerosis in the aorta34 and carotid artery,35 perhaps due to an explicit vasodilatory effect.36,37 Second, testosterone actively induces muscle protein synthesis.26,38,39 Both muscle mass loss in wasted patients40 or even rapid weight loss during weight reduction regimens41 have been correlated with testosterone decline. Thus, our observation that adjustment for s-creatinine levels (used here as a surrogate marker of muscle mass) resulted in the loss of effect on mortality may indirectly support this hypothesis. Although randomized controlled trials using low doses of exogenous testosterone in aged healthy men38,39 have reported favorable increases in muscle mass and other beneficial metabolic effects, no studies have yet assessed the effect of testosterone supplementation on death or CVD death as the primary end point. Although the study presented here reports a clear association between low testosterone levels and increased mortality, the question whether testosterone therapy would reverse the increased risk for cardiovascular complications is still open. Also, because our results suggest that increased inflammatory status is associated with hypogonadism, further studies are needed to test whether or not testosterone replacement may benefit the inflammatory status in these patients. In conclusion, we report for the first time that testosterone concentrations are inversely related to mortality due to both CVD and all causes in male HD patients. Because this association is lost after adjustment for s-creatinine, our data suggest that hypogonadism and muscle wasting are closely related. We also showed that patients with clinical signs of CVD presented lower testosterone levels, even after correcting for age and SHBG. Finally, strong inverse independent correlations were observed between testosterone and various inflammatory markers. Because low testosterone may constitute an additional risk factor in CKD men, data from the observational study presented here encourage further research into the role of testosterone as a modifiable risk factor in CKD and create a rationale for randomized controlled trials with testosterone supplementation in this patient group. The study was performed at five dialysis units in Stockholm, and one at the Uppsala Academic Hospital in Uppsala, Sweden. This is a post hoc analysis of data arising from a cross-sectional study originally aiming at investigating the variability of inflammatory markers in HD patients. The protocol has been previously described in more detail and patient recruitment took place between October 2003 through March 2004.43 Out of the 228 prevalent patients included in the study and followed for assessment of overall and cardiovascular mortality, 101 were women. Therefore, testosterone and SHBG levels were measured in the remaining 127 men. One male patient was excluded because not enough stored plasma was available. The Ethics Committee of Karolinska Institutet Hospital and Uppsala University Hospital approved the study protocols. Signed informed consent was obtained from all patients before inclusion in the study. A single clinician, who extracted data pertaining to the underlying CKD and CVD history, other comorbid conditions, and survival, reviewed each patient's medical chart. Survival was determined from the day of examination, with a mean follow-up period of 41 (20 to 47) mo. There was no loss of follow up of any patient. Cardiovascular mortality was defined as death resulting from coronary heart disease, sudden death, stroke, or complicated peripheral vascular disease. A nephrologist blind to other clinical or biochemical patient data registered the causes of death. Blood samples were collected before the HD session after the longest interdialytic period. Plasma and serum were separated and kept frozen at −70°C, if not analyzed immediately. Serum concentrations of IL-6 were quantified by immunometric assays on an Immulite Analyzer (Siemens Medical Solutions Diagnostics, Los Angeles, California) according to the instructions of the manufacturers. Plasma long pentraxin-3 concentration was measured by using a commercially available ELISA kit (Perseus Preteomics Inc., Japan). High-sensitivityCRP, fibrinogen, s-albumin, ferritin, s-creatinine, hemoglobin concentrations, and the percentage of hypochromic RBCs were analyzed using certified methods in the Department of Laboratory Medicine at Karolinska University Hospital or Uppsala Academic Hospital. Gonadal status was assessed a posteriori from frozen samples. Testosterone, progesterone, and SHBG were measured in all men participating in the study, using certified routine methods in the Department of Laboratory Medicine at Karolinska University Hospital. Free and bioavailable (not SHBG-bound) testosterone were calculated from total testosterone, SHBG, and s-albumin concentrations using mass action equations.44,45 Although no uniform definition of hypogonadal testosterone level is available, values below 10 nmol/L (300 mg/dl) are generally considered to represent deficiency.46,47 Accordingly, the following classification was used: (1) normal: testosterone > 14 nmol/L (403 ng/dl); (2) low-normal: testosterone 10 to 14 nmol/L (288 to 403 ng/dl); (3) low: testosterone < 10 nmol/L (288 ng/dl). Body mass index and dynamometric measurements were determined on a dialysis day. Handgrip strength was measured in the dominant hand (or nonfistula arm) with a Harpenden Handgrip Dynamometer. The highest of three measurements was noted. Subjective global assessment was used to evaluate the overall PEW.48 For the purpose of this study PEW was defined as subjective global assessment > 1. All variables were expressed as mean ± SD or as median (interquartile range), unless otherwise indicated. Statistical significance was set at the level of P < 0.05. Normality was assessed by Kolmogorov-Smirnov test. Comparisons between two groups were assessed with the student's unpaired t test and Mann-Whitney test or χ2 test, as appropriate. Differences between more than two groups were analyzed by ANOVA (ANOVA) using one-way ANOVA or Kruskal-Wallis test, as appropriate. Spearman's rank correlation (ρ) was used to determine correlations of testosterone with other variables. Multinomial logistic regression analyses were used to study the independence from age or SHBG levels of some of the observations made. Survival analyses were made with the Kaplan-Meier survival curve and the Cox proportional hazard model. The univariate and multivariate Cox regression analysis are presented as (HR; CI). All statistical analyses were performed using statistical software SAS version 9.1.3 (SAS Campus Drive, Cary, North Carolina). The following conversion factors may be applied: for conversion of SHBG to μg/dl, divide by 0.025; for conversion of free or bioavailable testosterone to ng/dl, divide by 0.0347; and for conversion of progesterone to ng/dl, divide by 31.8. B.L. is affiliated with Baxter Healthcare, Inc.
We would like to thank the patients and personnel involved in the creation of this cohort at each of the dialysis units. Also, we are indebted to our research staff at KBC (Ann Dreiman-Lif, Annika Nilsson, and Anki Emmoth) and KFC (Björn Anderstam, Monika Ericsson, and Anki Bragfors-Helin). The MIMICK study was supported by an unrestricted project grant from Amgen, Inc. We also benefited from Karolinska Institutet Center for Gender-Based Research, Karolinska Institutet research funds, MEC (EX2006-1670), the Swedish Heart and Lung Foundation, the Swedish Medical Research Council, the Swedish Exports Association, an unconditional grant from Scandinavian Clinical Nutrition AB, the GENECURE project (grant LSHM-CT-2006-037697), and research grants from the ERA-EDTA. Baxter Novum is the result of an unconditional grant from Baxter Healthcare.